The Sunrise Wrap features a complement of Silk Boucle knit in an easy to follow lace repeat pattern to create a stunning lace wrap. Create this shawl to fit your lifestyle as the pattern contains instructions for three lengths - casual, everyday or formal. This shawl is sure to be a favorite in your wardrobe as it easily goes from day to night. 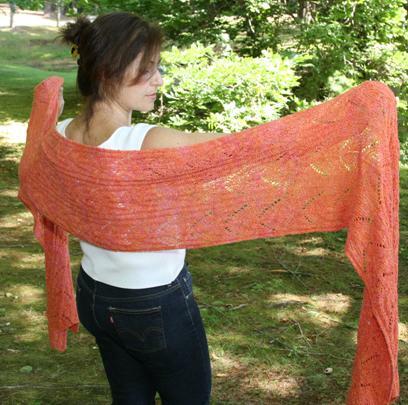 The Sunrise Wrap is designed by Tonia Barry Original Designs and knit using Ivy Brambles Rondure Silk Boucle yarn. Pattern contains directions for three different lengths for this wonderful shawl (Casual, Everyday, and Formal) using 1 to 3 skeins of Silk Boucle!